Financial documents filed in court show the park made $21.5 million from April 15 through September but that it owes nearly $300 million. Park owners had hoped to bring up to 30,000 people a day during the summer and 3 million people a year through its gates. Apparently that did not happen. Of particular interest to me is what will become of the par’s five roller coasters. One would assume that another amusement park company might pick tem up to add to their own parks. Coasters that currently site idle at Hard Park are as follows. This is a simple Vekoma junior family style custom coaster. Could be good for a small family park that is lacking a kiddie coaster in its ride collection. This family style coaster built by Premier Rides is described as a cross between a bucket-ride and a roller coaster in a wilderness campground setting. It features a steel track, suspended cars and an elevator lift system. This is a small Vekoma steel sit-down coaster which based on pictures of park models, very closely resembles a standard Vekoma 785m Mine Train. There are differences in the second half of the ride where a few curves and helixes are mirror images of the standard. Wrapping around a manufacturing plant is a wild ride mechanism where guests take English mini-sports cars – fresh off the assembly line – on a special test spin. Dominating the attraction is an industrial looking Ferris-wheel-type steel structure that lifts cars and riders up into place for their roller coaster ride drop, like a revolver cartridge chamber loads a gun. This is a B&M steel sit-down coaster which is 3738 feet long and 150 feet high at its highest peak. The ride six inversions including a 120′ tall loop, a 95′ tall Cobra Roll, a 75′ tall Zero−G Roll (Camelback) Loop and a Corkscrew (Flat Spin). The coaster reaches speeds of up to 65 mph. The theming of the ride begins at a huge airship, as if you are stepping onto the cover of Led Zeppelin’s debut album. Once inside, Led Zeppelin music and videos play throughout the queue, leading to a studio area where rockers are treated to a moving, multimedia show before climbing aboard the coaster itself. 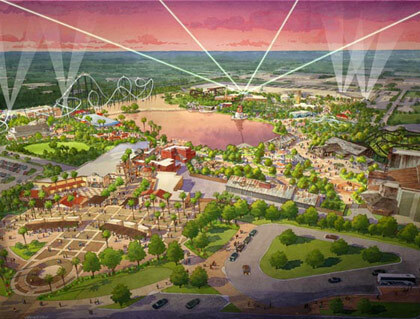 The park does have additional rides and attractions that might be a good fit for other parks including several swing-style rides, a carousel and even a 3-D dark ride. 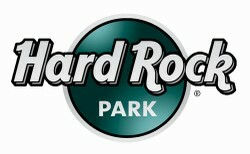 As far as the “Hard Park” name, Hard Rock International, the cafe and casino company, had licensed its brand name to the park for at least $2.5 million annually, but it is now asking a judge to allow the park to turn over various memorabilia and release them from the license agreement. Also questionable is the continued licesning of the “led Zeppelin” name for the roller coaster associated with it. It’s always sad to see a park close, especially one that has not even been open for a full year. Local tourism officials and national theme park experts have criticized the park for not advertising enough before its opening. It has also been said the park’s initial $50 ticket price (not including $10 for parking) may have scared off potential visitors.